A business cycle is a cycle of fluctuations in the Gross Domestic ProductGDP FormulaThe GDP Formula consists of consumption, government spending, investments, and net exports. We break down the GDP formula into steps in this guide. Gross Domestic Product is the monetary value, in local currency, of all final economic goods and services produced within a country during a specific period of time (GDP) around its long-term natural growth rate. It explains the expansion and contraction in economic activity Market EconomyMarket economy definition - a pure market economy is an economic system where there are no regulations and players are free to trade as they please that an economy experiences over time. A business cycle is completed when it goes through a single boom and a single contraction in sequence. The time period to complete this sequence is called the length of the business cycle. A boom is characterized by a period of rapid economic growth whereas a period of relatively stagnated economic growth is a recession. These are measured in terms of the growth of the real GDP, which is inflationFiscal PolicyFiscal Policy refers to the budgetary policy of the government, which involves the government manipulating its level of spending and tax rates within the economy. The government uses these two tools to monitor and influence the economy. It is the sister strategy to monetary policy. adjusted. The first stage in the business cycle is expansion. In this stage, there is an increase in positive economic indicators such as employment, income, output, wages, profits, demand, and supply of goods and services. Debtors are generally paying their debts on time, the velocity of the money supply is high, and investment is high. This process continues until economic conditions become favorable for expansion. 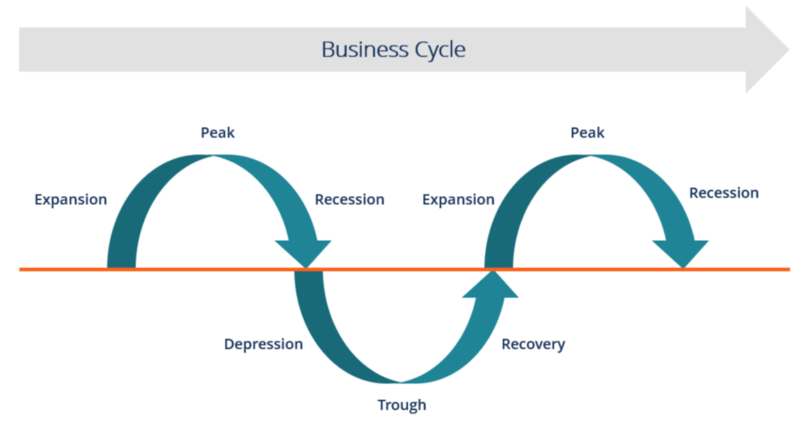 The economy then reaches a saturation point, or peak, which is the second stage of the business cycle. The maximum limit of growth is attained. The economic indicators do not grow further and are at their highest. Prices are at their peak. This stage marks the reversal in the trend of economic growth. Consumers tend to restructure their budget at this point. The recession is the stage that follows the peak phase. The demand for goods and services starts declining rapidly and steadily in this phase. Producers do not notice the decrease in demand instantly and go on producing, which creates a situation of excess supply in the market. Prices tend to fall. All positive economic indicators such as income, output, wages, etc. consequently start to fall. There is a commensurate rise in unemployment. The growth in the economy continues to decline, and as this falls below the steady growth line, the stage is called depression. In the depression stage, the economy’s growth rate becomes negative. There is further decline until the prices of factors, as well as the demand and supply of goods and services, reach their lowest. The economy eventually reaches the trough. This is the lowest it can go. It is the negative saturation point for an economy. There is extensive depletion of national income and expenditure. After this stage, the economy comes to the stage of recovery. In this phase, there is a turnaround from the trough and the economy starts recovering from the negative growth rate. Demand starts to pick up due to the lowest prices and consequently, supply starts reacting, too. The economy develops a positive attitude towards investment and employment and hence, production starts increasing. Employment also begins to rise and due to the accumulated cash balances with the bankers, lending also shows positive signals. In this phase, depreciated capital is replaced by producers, leading to new investment in the production process. Recovery continues until the economy returns to steady growth levels. It completes one full business cycle of boom and contraction. The extreme points are the peak and the trough. John Keynes explains the occurrence of business cycles as a result of fluctuations in aggregate demand, which bring the economy to short-term equilibriums that are different from a full employment equilibrium. Keynesian models do not necessarily indicate periodic business cycles but imply cyclical responses to shocks via multipliers. The extent of these fluctuations depends on the levels of investment, for it determines the level of aggregate output. On the contrary, economists like Finn E. Kydland and Edward C. Prescott, who are associated with the Chicago School of Economics, challenge the Keynesian theories. They consider the fluctuations in the growth of an economy not as a result of monetary shocks, but a result of technology shocks, such as innovation. It is generally rejected by mainstream economists who follow the path of Keynes. Inelastic DemandInelastic DemandInelastic demand exists when the consumer’s demand does not change as much as the price. Inelastic demand often affects commodities and staple goods.